For more than a decade, labor market specialists have been warning that the United States is not training the required number of students in science, technology, engineering and math to remain competitive in the digitized global economy. But where exactly these shortages exist and how exactly to do address them remain unanswered questions. As the Bureau of Labor Statistics (BLS) reported in a study on the alleged shortage of STEM workers in the academic, government and private sectors in 2015, "Across all the different disciplines, yes, there is a STEM crisis, and no, there is no STEM crisis. It depends on how and where you look." The BLS views the STEM workforce through the prism of the Standard Occupation Classification Policy Committee, excluding managerial and sales occupations. "Under this definition, postsecondary teachers in STEM fields and lab technicians are considered STEM workers, but workers in skilled trades, such as machinists, are not," the report stated. That's an important distinction for America's manufacturing industries, which rely far more heavily on skilled trades such as electricians and machinists than, say, computer software and mobile app developers. 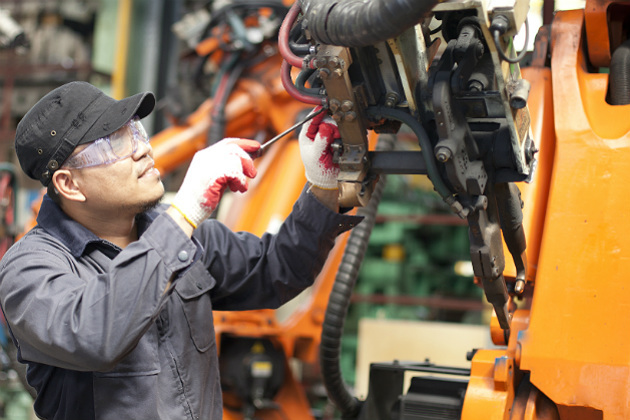 Offshoring, automation and robots have taken many an American factory job, but there's still an urgent need for workers who have the skills and the knowledge to operate, maintain, test, troubleshoot and repair these systems. These include occupations that don't necessarily require a four-year degree, or in some cases even an associate's degree or a certificate at the community college level, and therefore aren't always classified as STEM jobs. Some of them involve, gasp, manual labor, and more than a few could have featured on Mike Rowe's Discovery Channel TV series "Dirty Jobs." While the BLS and other agencies don't count them as STEM occupations, it cites a 2011 survey of manufacturers finding that "as many as 600,000 jobs remain unfilled because there is a lack of qualified candidates for technical positions requiring STEM skills — primarily production positions (e.g., machinists, operators, craftworkers, distributors, and technicians). Some are concerned that very few people are pursuing employment in the skilled trades." Consider Mark Richardson concerned. The director of the Advanced Plastics Manufacturing Initiative at Oakland University in Rochester, Michigan, Richardson is a manufacturing engineer who formerly worked at Dow Chemical before going the academic route. In addition to developing the plastics program and instructing at Oakland University, he consults nationally with plastics manufacturing companies on among other issues renewable plastics and workforce development. He's so concerned about the gap in the skilled and semi-skilled trades, he's calling for nothing less than a revolution. "We need to have a fundamental change," Richardson said. "It's the nature of our culture and there has to be a cultural change." Richardson concurs with the BLS finding that among young people today, there's a lack of interest in the manufacturing trades. That very same lack of interest is exacerbated by an education system that generally encourages all students to pursue four-year and post-graduate degrees. "I think the problem is twofold," he said. "There's a perception of manufacturing as a terrible, awful, dirty place to work every day. It's true, there are still some factories that are incredibly dirty. But one reason I went into plastics is, the manufacturing facilities can be amazingly pristine." Nevertheless, he hears teens and young people say, "I'm not going to work in my grandpa's factory." Not that anyone is encouraging them to do so. "By-and-large in our high schools, we're emphasizing that everyone must go to a four-year university, not to be successful, but just to survive," he said. "Students think, 'I'll never find a good job.' We tell students to go to a 4-year college, even if you don't know what they want to do." The problem with this reasoning, Richardson said, is, "We know that's not true. Being an operator, semi-skilled to highly-skilled, requires knowledge of technology and science, but it doesn't necessarily take a four-year degree," he said. As an instructor at Oakland University's School of Engineering and Computer Sciences, he's experienced this first-hand as his students are snapped up, practically before the ink on their diplomas or certificates dries, by the many plastics and polymers manufacturers that serve the automobile and other industries in the region. All of this is happening while unemployment in the Detroit area remains persistently higher than the nation's since the Great Recession, indicating the demand for skilled and semi-skilled employees has yet to be met. "Personally — not all teachers see it this way — I see the university serving two customers: our students and our corporate partners," he said. "We have partnered with the community colleges to create a network where companies can go to find the workforce that they need at all levels." Davis-Standard leads the world in developing plastic extrusion and conversion machinery. Davis-Standard is one of the world's leading manufacturers of high-performance plastics and rubber processing equipment. The workspaces at its Pawcatuck, Connecticut, research and development facility, where the firm's complex extrusion and conversion machinery is designed, manufactured, assembled and tested, exemplify the pristine environment of the modern plastics factory cited by Richardson. Davis-Standard extrusion-conversion machinery is used around the world to manufacture insulated cable, supermarket packaging, IV tubing, polymer coatings and countless other products for the construction, healthcare, automotive, food and beverage, electronics and energy industries. It has branches in the eastern United States, South America, Europe, Africa and China. It might not be a household name, but Davis-Standard is an important company. Without its machinery, thousands of products we take for granted would not exist. But if you think graduates from the nation's top universities are crashing Davis-Standard's gates for the opportunity to pioneer the next big breakthrough in plastics, think again. "There is definitely a skills gap," said Charles Lewis, human resources vice president for Davis-Standard. The company is struggling both to find degreed engineers and polymers scientists as well as the skilled and semi-skilled employees required to operate, test and install its complex, intricate machinery. As far as degreed engineers and polymers scientists are concerned, Davis-Standard's location on the remote Connecticut seashore works against it. As the BLS notes, degreed STEM workers are flocking to Silicon Valley, Seattle, New York City and other centers of technology, finance and commerce. The laid-back lifestyle in the Nutmeg State and other rural areas isn't as attractive as the big city. "We have to create a marketing campaign," Lewis said. "Is this a climate you would enjoy?" Additionally, Davis-Standard must compete with nearby Electric Boat, which manufacturers submarines for the U.S. Navy, for the relatively smaller number of degreed engineers and scientists attending the region's seven universities who are willing to relocate to Connecticut. The same thing goes for CNC-qualified machinists. "Electric Boat also has the same skill-set need as us, we're competing with them for our machinists," Lewis said. He echoed Richardson's urgency, particularly on the topic of his company's aging workforce. When today's engineers, scientists, machinists and electricians retire in the coming decades, there may not be a new generation trained to replace them. "We need to be more involved," he said. "We've identified local trade schools and community colleges, and we're building relationships with those schools." To reach local high school students, Davis-Standard participates in the Society of Plastics Engineers PlastiVan program, a touring sideshow of fascinating chemistry experiments designed to introduce young and old alike to the modern marvels of plastic. In nearby Westerly, Davis-Standard has helped introduce manufacturing into the high school's curriculum. It is also recruiting potential employees directly from local high schools and community colleges. "We have taken the route of finding young people who have the aptitude and training them ourselves," he said, adding that Davis-Standard faces similar challenges finding skilled and semi-skilled workers for its overseas operations. "In Asia, our approach has been to find good, young Asian engineers and train them in the United States." On an overcast day in early January, I tagged along with a score of Shasta High School Industrial Technology students as they toured Sierra Pacific Industries' flagship sawmill in Anderson, California. Full disclosure: their teacher, Chris Scheide, is one of my two younger brothers and I occasionally substitute teach for him. He figures anywhere from 30 percent to 50 percent of his students go on to some sort of career in engineering. For the past decade, my brother has been involved in a regional effort to provide a STEM pathway for manufacturing and engineering students in far northern California that includes the local Shasta Community College, a dozen area high schools and a host of local businesses, including large employers such as Sierra Pacific, Knauf Insulation and Seco all the way down to mom-and-pop machine shops. Sierra Pacific operates mills in California and Washington and is a leading manufacturer of wood-framed windows. Currently the mill in Anderson is processing 3,000 logs per day, turning them into neat stacks of lumber that lately have been railed to reconstruction efforts in fire-ravaged California and hurricane-struck Houston, among other disaster zones. 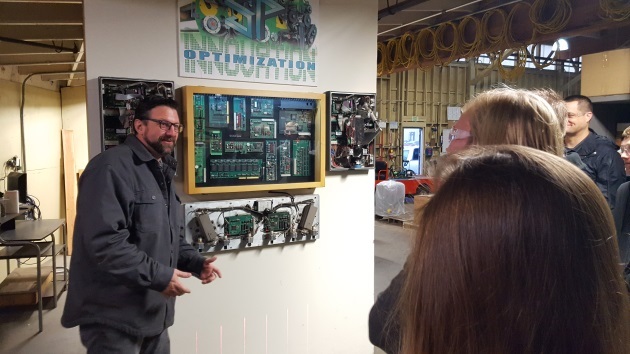 On the tour, Sierra Pacific tech shop manager Drew Peterson demonstrated how automation, optimization and miniaturization have transformed the modern timber mill. 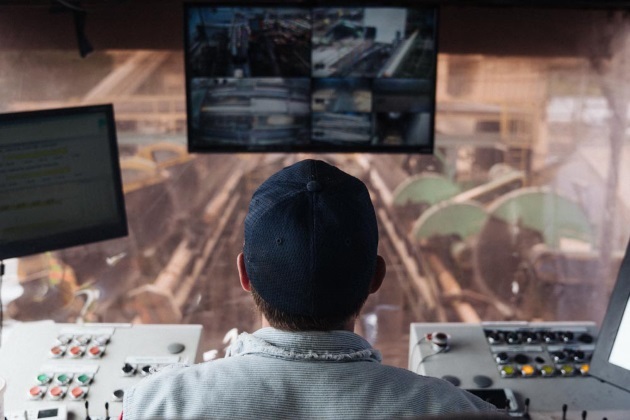 It's all about programable logic controllers, or PLCs, which have automated and optimized an industry that sort of looks like your grandpa's timber mill — with vastly improved workspace conditions — but is light years beyond it in terms of productivity. Now seems like a perfect time to mention the crucial role the plastics industry has played in providing the components for the digital revolution. For safety reasons, the tour couldn't go inside the sawmill, but today's sawyers sit in a sealed control booth overlooking the logs directly and with an array of video cameras, controlling multiple saws with multiple panels of buttons, each corresponding to a PLC that makes the adjustment to log and machine required to get the most wood out of the process. "You want a tactile environment," explained Peterson, Sierra Pacific technology shop manager and our tour guide. Computer algorithms and laser beams tell the operator exactly which boards, two-by-fours, four-by-fours, two-by-eights, etc., can be cut from any given log. This process alone was formerly performed by a sawyer and a ratchet-setter riding in a moving carriage parallel to the saws. The sawyer eyeballed his measurements and the ratchet-setter had an exceptionally low life expectancy. Yet despite these advances brought by the digital revolution, here's the most interesting thing I learned on the tour. The folks on the factory floor don't trust the computers. "We don't trust computers," Peterson said. "A computer is good at showing what should happen. An operator is needed for what actually happens." Sierra Pacific's fabrication shop, situated in a cavernous structure large enough to contain a small blimp, certainly resembles your grandpa's factory. Off to one side, there's a bank of state-of-the-art Haas CNC machinery, four milling machines, two lathes and a bar feeder. There's a corresponding bank of manual machines as well. On the other side, most impressive were the Kinetic Plasma Cutter, 12'x72,' and the Omax Waterjet, 10'x20,' each respectively burning and etching sheet steel components for a chain race the size of a railroad boxcar. A band saw that looked like some sort of oversized tractor, and a log stacker comprised of chains, sprockets and welded steel beams completed the scene. "We don't just build stuff from scratch," explained Sierra Pacific mechanical engineer Nelson Wheelehan. "We rebuild and repair machines for all of our other mills. We like to run equipment here. This stacker is going to Sonora. All our fabs are expected to install the equipment as well." Like Davis-Standard, Sierra Pacific is based in a rural region and faces similar challenges when it comes to recruiting both degreed engineers and scientists as well as skilled and semi-skilled STEM employees. "There is a huge demand for automation and controls specialists, programmable logic controller (PLC) programmers, and a next generation workforce that inherently includes technology in a variety of applications to assist in finding solutions," said Sierra Pacific spokeswoman Becky Roe. "Filling jobs locally is important to the company and the communities where we have operations. However, there is generally a shortage of local candidates that are qualified to fill STEM career pathways." Can high schools and community colleges bridge the STEM skills gap? "Everything you're hearing about here today, we've got a program for it," said Rick Osbrink, head of Shasta Community College's Industrial Technology Department, to the high school engineering students at the end of Sierra Pacific tour. There's a reason for that. "This program was a direct development from our work with our local partners," Osbrink told me later. "We asked them, 'What do you need from us?' and they told us." One thing Osbrink discovered was a local demand for workers with manual machinist skills. To meet the demand, Shasta Community College, in addition to recently adding a full compliment of Haas CNC machinery, has acquired manual lathes and milling machines as well. He recalled visiting one regional machine shop and observing there was no employee under the age of 30. "What are they gonna do when their employees retire?" Osbrink worried. Shasta Community College previously created its well-attended welding program with the help of the same community partners, and early indications are promising for the school's expanding industrial technology curriculum. Sierra Pacific's Career Advancement Pathway Program provides scholarships to local students seeking careers in both the degreed and skilled trades. Over the past several years, my brother, with the support of Shasta High School administrators and the business community, has assembled an impressive collection of Haas CNC machinery and 3-D printers for the school's machine shop. His classes are well-attended, but he still has to contend with the fact that wood shop and metal shop aren't exactly on today's high school students' radars. "Some students don't even know that we have a shop," Scheide said. "I have talked to former graduates who say that they would have loved to take a 'shop' class but didn't know they existed." That particularly applies to female students, who historically have been under-represented in STEM fields and remain so. He has at most 4 to 5 girls in each class of 30 students. "Some of my female students have reported that their friends don't want to take it because there are too many boys in the class," he said. While similar coordination between high schools, community colleges, universities and manufacturing companies is taking place in regions across the country, from California to Michigan to Connecticut, there's an ad-hoc nature to the proceedings that betrays a disturbing fact, if the shortage of STEM workers is as urgent as some observers claim: We, the United States, don't really have a national strategy to address the issue. Mark Richardson, the Oakland University instructor and plastics industry consultant, has visited community colleges that, with the best of intentions, have fully equipped their machine shops with the latest technology only to see no one sign up for classes due to lack of interest. Richardson is intrigued with President Donald J. Trump's executive order expanding apprenticeship programs in America, but at the same time he's pessimistic. The order directs that up to $200 million be spent consulting with industry leaders on developing apprenticeship programs to train the workforce of the future. Apprenticeship programs have been successful in countries like Germany, where the partnership between manufacturing corporations and government has existed for 75 years. Meanwhile, such programs have declined in the United States, along with the decline of labor union representation, where the practice was once common. "We often hear, look at what X in Europe has done, why can't we do it that way?" Richardson said. He then answered his own question. "We are huge, geographically. In Europe, some of the states are relatively small. We don't do apprenticeship programs here like they do in Europe. There are relatively isolated pockets, but it's not a generally accepted mode of training. There's some confusion as to how this money is going to be used." Richardson is concerned that the complexity of today's digitized manufacturing processes might not lend itself well to typical apprenticeship programs, which require both work and study. "You can't have a student working full-time and trying to get through calculus and physics," he said. But there may be a more pressing concern than that. The increased demand for skilled and semi-skilled STEM workers has driven up wages in industries such as petroleum fracking, and will likely do so in other industries, if they hope to attract skilled employees. In a global economy where the United States still enjoys a higher standard of living than many of its manufacturing competitors, that's a problem. "The U.S. has started to realize that the concept of re-shoring manufacturing may not be feasible, because we still have much higher operating costs," Richardson said. Trump's Task Force on Apprenticeship Expansion will present its first findings, culled from 20 yet-be-named corporations selected for their experience with apprenticeship programs, on Feb. 9. R.V. Scheide has been a northern California journalist for more than 20 years. He appreciates your comments and story ideas.